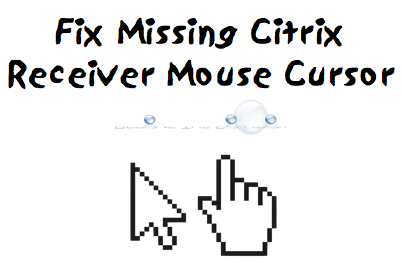 If you are running the latest version of Citrix Receiver 12.8, you may be experiencing issues with your Citrix mouse pointer suddenly disappearing while you work. The only way to recover your Citrix mouse cursor is to disconnect from your Citrix session and reconnect. However, your Citrix mouse cursor will disappear randomly again. To fix the disappearing Citrix mouse cursor, downgrade to Citrix Receiver 12.7 following the steps below. Download Citrix Receiver 12.7 here. Uninstall the previous version of Citrix Receiver (12.8) using the uninstaller utility included in the download. Once the uninstallation completes, install Citrix Receiver 12.7. Tthank you.. This made me crazy..